and a wide choice of food and beverage experiences. and popular local attractions including the Banff Gondola and the mineral-rich Banff Upper Hot Springs. 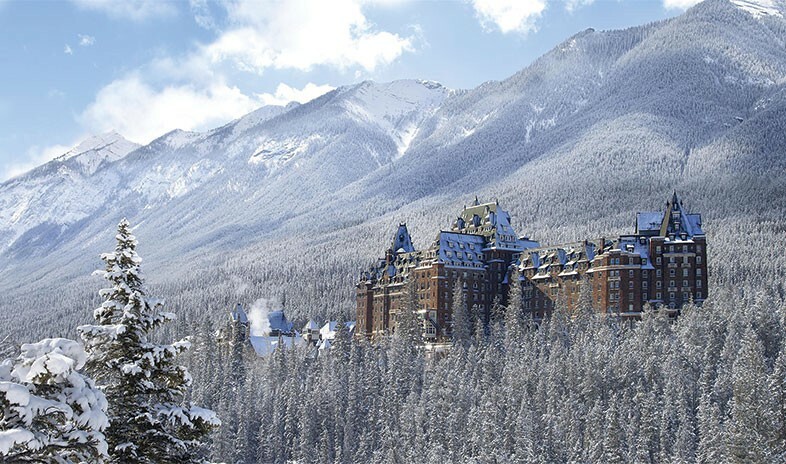 Modeled after a Scottish castle, Fairmont Banff Springs looms as an impressive baronial presence against the spectacular natural wonders of Banff National Park in the Canadian Rockies. Perched overlooking the pristine Bow River, the AAA Four Diamond Award–winning resort features 764 richly appointed guest rooms and suites, including a newly renovated Fairmont Gold floor with private check-in and privileges in the Fairmont Gold Lounge. A favorite destination for heads of state and international celebrities for more 125 years, the resort offers a full slate of activities that span the seasons, from skiing the “Champagne powder” at three nearby ski resorts to championship golf against a majestic mountain backdrop. Back on the property, the famed Willow Stream Spa pampers and rejuvenates with treatments and dips in the mineral pool. When it’s time to refuel, guests dine in a rich array of venues, from a wine bar to a sushi bar to a Bavarian house in the forest. Celebrated for providing legendary hospitality and amenities, Fairmont Banff Springs provides the same attention to detail for small gatherings or groups of up to 1,000 attendees. Meeting planners choose from 72,000 square feet of indoor space encompassing intimate boardrooms, conference areas, and elegant ballrooms. A comprehensive array of leading-edge technology and experienced meeting professionals ensure support and expertise for all functions. For turnkey planning, Fairmont Signature Events feature on-site themed functions and customized excursions. The views from every space are breathtaking! The location was very convenient and the meeting space is topnotch. The US dollar goes further in Canada! Receive more value with the strong US dollar and GST rebates.